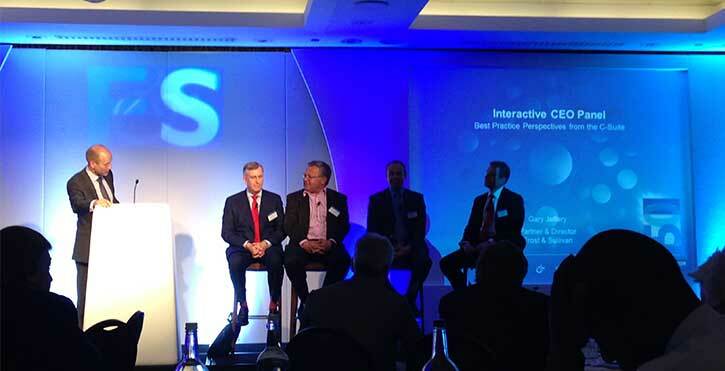 On Wednesday we had the pleasure of taking part in two great Frost & Sullivan events. First, I joined Steve Flavell, our co-CEO, at its GIL 2014: Europe event, an event uniting a global community of senior executives to explore the themes of Growth, Innovation and Leadership. Then, in the evening, a group of LoopUp team members assembled to attend the Frost & Sullivan Best Practices Awards Banquet, during which Steve, on behalf of LoopUp, accepted the 2013 European Frost & Sullivan Award for Entrepreneurial Company of the Year. A very exciting day indeed! The GIL 2014 event during the day was an opportunity to discuss how companies can “leverage innovation as a resource to address global challenges”. Its packed agenda included a keynote on Google’s Vision of 10x Innovation, facilitated by Mark van der Linden, Country Manager UK and Ireland, Google Enterprise. The closing session of the day was an interactive CEO panel, which was a forum for CEOs of Best Practice award-winning companies to share their perspectives. Steve participated in this panel, joined by Jeroen Hol of Minkels International, Mark Johnstone of JSP Ltd., and Prof. Stephen Weston of Maxeler Technologies. Their discussion was wide-ranging and reflected the diverse fields these companies operate in. However, it was interesting to me the number of ways in which these CEOs were in agreement; I believe these shared values may be key to their respective successes. For example, everyone on the panel agreed that while technology-led differentiation is clearly very important – it’s how LoopUp competes – that sustainable success still all comes down to the people involved. All of the CEOs remarked that, even during the recession, they had maintained or increased their spend on employee training, i.e. that they value the people who make the company work. There was also discussion of mega trends impacting the world today and how they might evolve between now and 2020. Steve discussed the need for a ‘return to simplicity’ in the world of unified communications and enterprise collaboration, in the sense that the increasingly overwhelming technology needs to collapse down to a more discrete set of solutions that focus on solving specific problems, rather than offering hundreds of features. Steve believes there are currently too many UC platforms masquerading as solutions, as discussed in this blog post. GIL Europe 2014 left us feeling energized and inspired, and nicely segued via a drinks reception into the evening’s festivities. 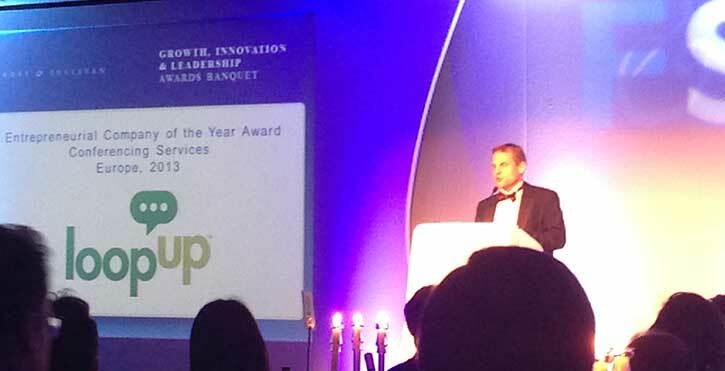 Steve took to the stage to accept our Award for Entrepreneurial Company of the Year 2013, and underlined in his speech how pleased he was that LoopUp was being recognized (again!) for its disruptive approach to the unified communications marketplace, offering a product that makes conference calling less painful and collaboration easy. Thank you very much to Frost & Sullivan for the award and for the hospitality – we hope to see you again next year!